Registration for this meeting will be $25 for Mass. 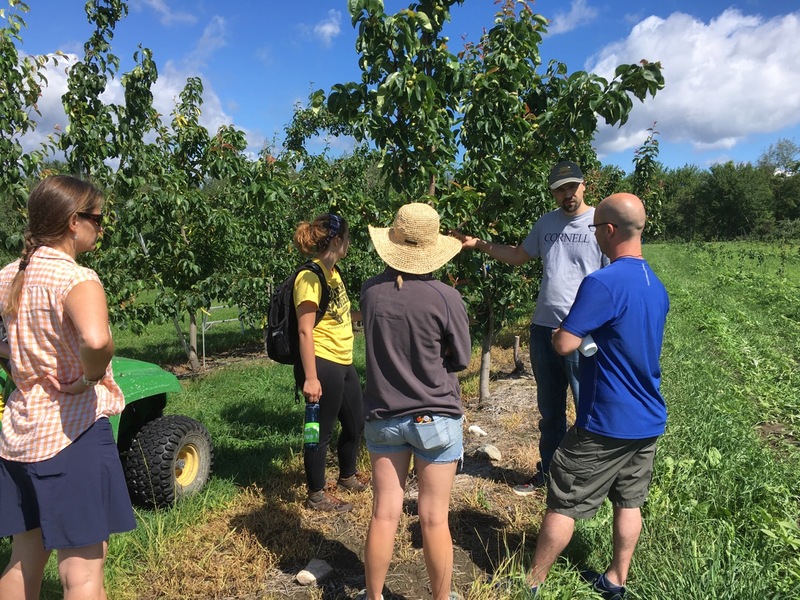 Fruit Growers’ Association members ($35 for non-members) per person and will include the tour, educational program, pesticide recertification credits, and lunch. To ensure the availability of the meal, please pre-register by adding the appropriate number and type (member or non-member) registrations to your shopping cart and paying with a credit card. We must receive pre-registrations by Friday, July 7 to assure availability of the lunch. PDF version of this announcement -- print and register via US Mail. Obliquebanded leafroller OBLR -- 1st generation OBLR flight begins around June 8, Thursday. Where waiting to sample late instar OBLR larvae is not an option (= where OBLR is known to be a problem, and will be managed with insecticide against young larvae): Early egg hatch and optimum date for initial application of B.t., Delegate, Proclaim, Intrepid, Rimon, Altacor, Belt, pyrethroid or other insecticide effective against OBLR (with follow-up applications as needed): June 21, Wednesday. Where waiting to sample late instar OBLR larvae to determine need for treatment is an option, or to check on results from earlier sprays: Optimum sample date for late instar summer generation OBLR larvae: June 30, Friday. If first OBLR late instar larvae sample is below threshold, date for confirmation follow-up: July 3, Monday. Oriental Fruit Moth OFM -- 2nd generation OFM flight begins around: June 25, Sunday. 2nd generation - first treatment date, if needed: July 2, Sunday. 2nd generation - second treatment date, if needed: July 14, Friday. Redbanded Leafroller RBLR -- 2nd RBLR flight begins around June 26, Monday. Peak catch and approximate start of egg hatch: July 9. Spotted Tentiform Leafminer STLM -- 2nd STLM flight begins around: June 14, Wednesday. Rough guess of when 2nd generation sap-feeding mines begin showing: July 2, Sunday. Optimum first sample date for 2nd generation STLM sapfeeding mines is July 8, Saturday. Pretty quiet this week so far. 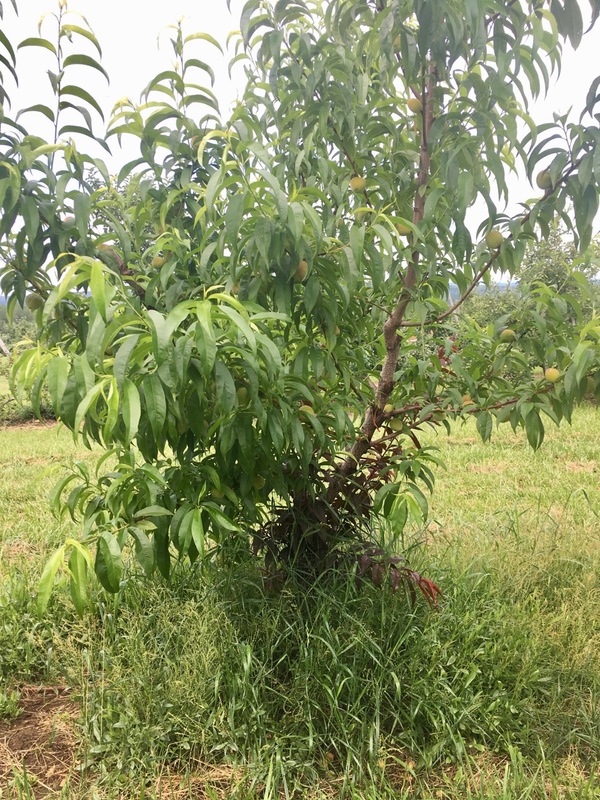 Peach hand thinning is ongoing, apple hand thinning to begin ASAP. (Getting it done earlier vs. later is better for return bloom.) Sprays for obliquebanded leafroller going on, pheromone trap catches continue to be high. Potato leafhopper has appeard with a vengeance in top-worked trees with succulent shoot growth and "hopperburn" (picture) already being observed there. Scab is out there where fungicide sprays were lacking. 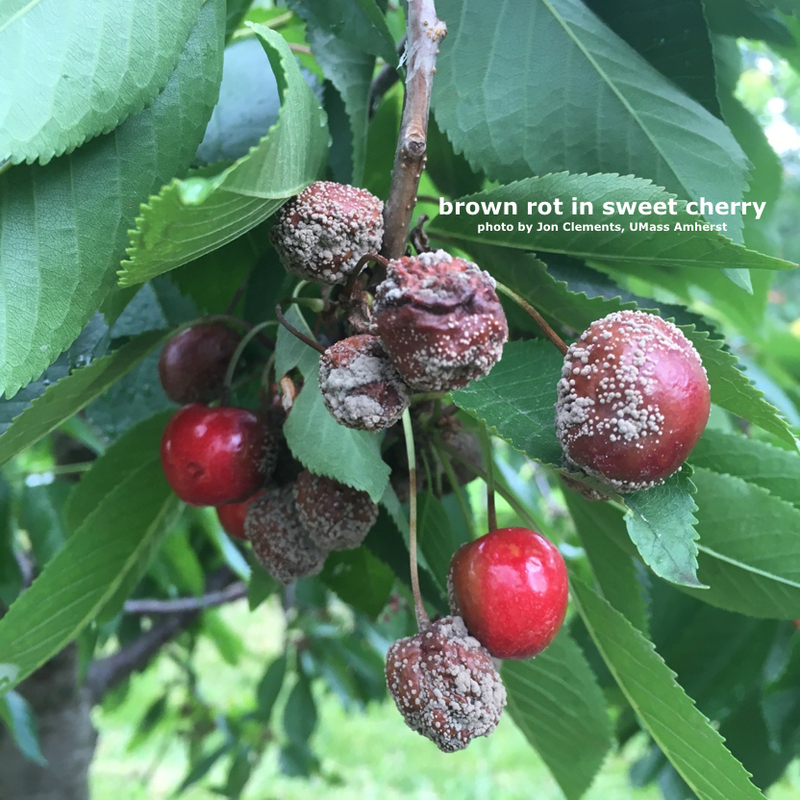 Cherry harvest has begun, and given the weather, brown rot (picture) is bad where it has not been adequately controlled. (Yuk!) I've heard reports of serious hail damage in western NY, the crop is down in Michigan because of spring freeze -- the Eastern apple crop is going to be down this year. Watch the sky, but there is nothing to do about it, cool air aloft spells hail, let's all wish it out of here though. Yesterday (June 26) -- and with help from our UMass interns (Nicole Foley, Caitlan Davis, and Paul O'Connor) and Elizabeth Garofalo -- Srdjan Acimovic from Cornell's Hudson Valley Lab showed up (with technician Christopher, not picutred) to flag terminal shoots in our 2010 Asian pear planting in preparation for inoculation with fire blight. (Happening tomorrow if all goes as planned.) Srjdjan's research objective here is to get fire blight cankers to form, and then track their development and epidemiology as a source of fire blight infection down the road. Apparently, not much is known about the viability of cankers over time and how likely they are to produce "ooze" and become a source of fire blight outbreaks in upcoming seasons. We are glad to be able to lend a hand here, and hope to contribute to our knowledge of the fire blight disease and control options here in the Northeast. It all began in the dark ages, the late 1990’s that is, in Allentown, PA. This was when BMSB was first identified stateside. From here it began to creep its way out into homes and wooded areas, bugging people wherever it was found. In 2010, an already uneasy relationship became untenable. 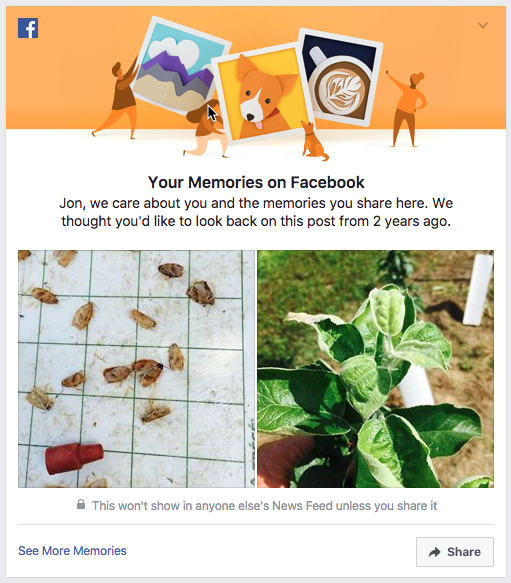 By the end of the season growers were reporting complete crop losses, in some cases. To the tune of $37 million lost in apples alone. In 2011 the EPA approved an emergence y dispensation for the use of dinotefuran in tree fruit in states where losses were catastrophic. There is, however, a silver lining to the dark cloud that is BMSB. Trissolcus japonicus likely came into the country by way of already parasitized stinkbug egg masses in cargo containers. In spite of not having been intentionally released by researchers, she has been found and positively identified in the wild by researchers at the USDA Beltsville lab (also in the pacific NW and in the Hudson Valley). She has been under study as a potential for intentional biological control of BMSB. In the lab she has been shown to favor egg masses of BMSB over other stinkbugs. This year, she I scheduled to be released in areas most severely impacted by BMSB. If you are interested in determining the presence of BMSB in your orchard, there are several methods of trapping available to you. AgBio carries several different types of traps and an aggregation pheromone lure shown to work best for BMSB. The taller, black, pyramid traps have shown themselves to be highly effective at drawing in BMSB but do require more accessories than the others available. There are other traps on the site that are more user friendly and also effective at trapping. Great Lakes IPM also carries BMSB trapping supplies. Here you can find lures as well as the “rocket trap”, which I find to be exceptionally easy to use and does not require the addition of a kill strip. Ed. note: as a reminder, we have no documented agricultural economic injury from BMSB in Massachusetts. Even though we have been trapping and catching BMSB in many sites for a number of years -- generally in very limited quantity. I wish everyone reading this, however, would go to http://www.agbio-inc.com/stink-bug-traps.html and purchase one or two of the DEAD-INN stink bug traps (from here http://www.ecogreenwarehouse.com/dead-inn-stink-bug-trap/) and place them where the orchard intersects your home and/or winterized buildings. (This, I feel, is the most likely place to detect the presence of BMS around here.) Let us know if you catch anything! Also, be advised that garden-variety brown and green stink bugs can also cause fruit damage. 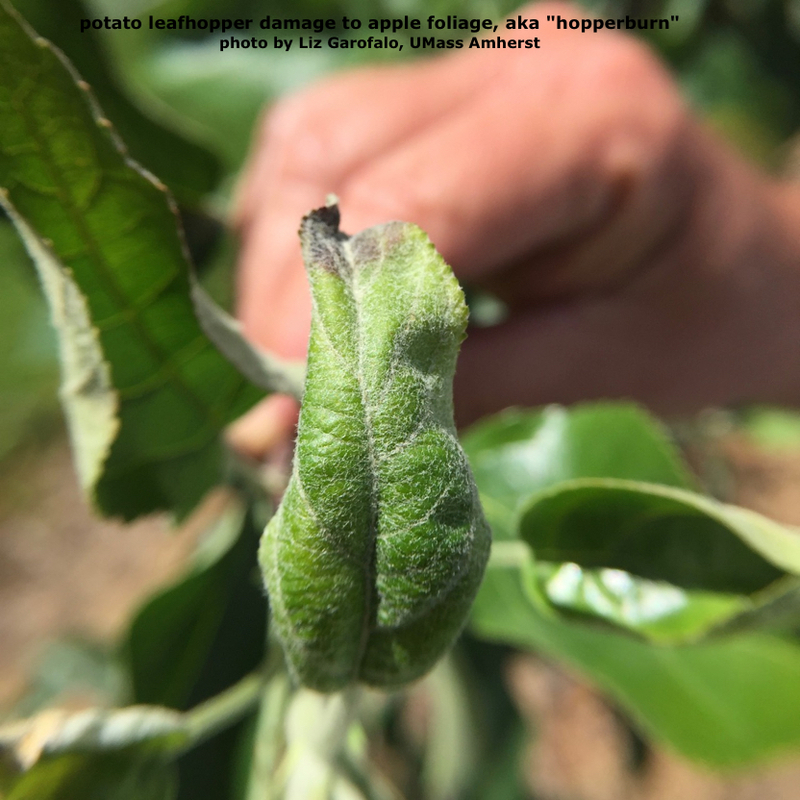 Some years populations are higher than others, and if you have little or no tolerance for stink bug injury to apples or peaches, well control information can be found here: http://ag.umass.edu/fruit/new-england-tree-fruit-management-guide/apples/spray-table/9-summer. Sooty Blotch and Flyspeck (SBFS) are caused by a group of fungi which grow superficially on waxy cuticle of apple fruit. Usually, flyspecks caused by Zygophiala jamaicensis show first and then the sooty blotches which are caused by a complex of species including Schizothyrium spp. These symptoms reduce fruit quality as surface blemishes that reduce market value. Dr. Kari Peter also reports that sooty blotch can shorten fruit storage life because it allows increased water loss. 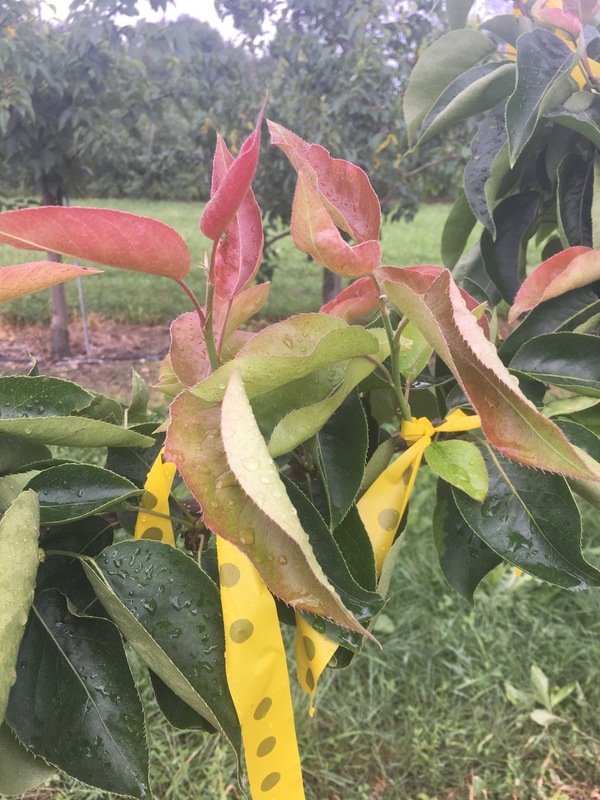 In most years, according to Dr .David Rosenberger we have operated under the assumption that there is reduced risk from this disease between PF and the time until an orchard accumulates 190 hr of wetting (counting from PF onward and using NEWA data for your specific location). Looking at the HVRL’s NEWA, leaf wetting data in May summed up to 195 h, then knowing we had lingering PF during 2.5 first weeks of May, and then we got 108 h of wetting in June, we surely did surpass 190 hr of wetting to allow abundant flow of SBFS spores into apple orchards. The spores are coming from near-orchard vegetation in hedgerows and forest trees lots where the SBFS fungi overwinter on the waxy cuticle of canes, shoots, twigs, fruit and leaves of large number of inoculum reservoir plant hosts. From there, SBFS spores are spread to pome fruit by wind or wind borne rain aerosol drops. In worst cases, such the 2017 seems to be due to so much rain we had, SBFS infections can start on fruit as early as 2-3 weeks after petal fall. Symptom occurrence after infections are initiated is of course all dependent on environmental factors and can take place for several weeks to months later. I think we are up against the former i.e. harder scenario in 2017, where moderate temperatures at and after PF with prolonged leaf wetness periods and high RH will trigger symptoms to appear sooner than later if cover sprays with fungicides were not applied on a tighter schedule than usual 14-21 days we are all used to do. Now, 2017 so far was very wet in terms of wetting hours with a lot events with 2″ or near-that amount of rainfall. We probably already passed 190 hr of accumulated wetting from PF for most farms. So if on your farm you reached 190-hr of accumulated leaf wetting from PF, which I assume most of you did, SBFS spray program should have started. After you start(ed) your SBFS program, then you should respray at 14-21 day intervals, with the 14-day interval to be used if by those 14 days you have already accumulated 2 inches of rain since the last spray. The longer interval of 21 days should be used for dryer periods with less than 2-inches of rain. If you reach 2-2.5 inches of rain before the 14-day mark from the last spray – you should re-spray. In NY and New England, we almost never see sooty blotch until after flyspeck has been visible on fruit for a week or more. If you control flyspeck (FS) well, you will also control sooty blotch. This is because sooty blotch (SB) is controlled by lower amounts of fungicide than the flyspeck (Dr. Rosenberger, personal communication). The one exception, when SB can show up before FS is if heavy rains late in summer remove all fungicide residue and the orchard owner does not respray before harvest. This happens if 2.5-3.5 inches of rain fall in usually singe storm event. In commercial orchards, we have to make sure that there is almost always enough fungicide residue to slow down SB at some point during the 190 hr incubation period for FS (NEWA). If rain reduces fungicide residues, FS will show up first because it can grow through a bit more fungicide residue than SB. In the lower Hudson Valley, if by any chance we had a drier spring and early summer (which we did not), start of your SBFS spray program must not be delayed after July because you need to spray starting no later than July 10 to prevent summer fruit rot infections. From 10 July, infection pressure from summer rots gets very high. In our unsprayed blocks at HVRL the SBFS symptoms have not expressed yet. We will keep you posted when they do. Ed. note: some things never change...do they? The next Healthy Fruit will be published on Tuesday, July 11 or thereabouts, 2017. (Taking a break for the July 4th Holiday.) As always feel free to get in touch with any member of the UMass Fruit Team (http://extension.umass.edu/fruitadvisor/team-members) if you have questions or comments.